The epc635 Evaluation Kit is a fully assembled and tested camera system designed for the evaluation of the epc635 Time of Flight (TOF) imager. The foundation of this kit is the DME 635 distance measurement camera which provides all necessary hardware to operate the epc635 imager chip, including both the camera lens and illumination. The system is fully controllable by an intuitive GUI on a PC or Mac computer. The DME 635 distance measurement camera is a standalone 3D TOF Distance Measurement Camera with a resolution of 160 x 60 pixel (Half-QQVGA). 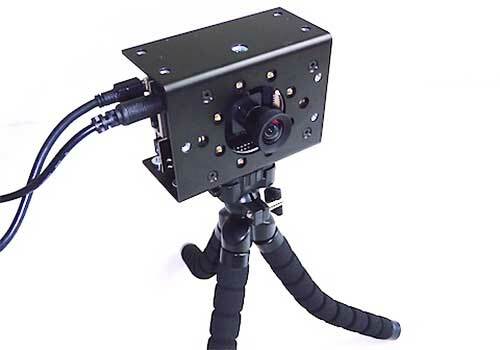 This camera system is built from a combination of three independent parts: an epc635 sensor board with a 56° FOV lens, an LED illumination board, and a BeagleBone Black as a host controller board. The host controller board provides a powerful and flexible development environment for the design engineer. The very wide field of view (FOV) of 56° is a perfect basis for an application evaluation. The normal operating range of the included LED illumination board is up to 17m, depending upon the selected integration (exposure) time and the object reflectivity. 128 full frame TOF images per second in full resolution allow for very fast imaging applications. The extreme high sensitivity of the imager chip epc635 also allows for very short exposure time. ESPROS Photonics is a world-class foundry, product, and technology solution provider for optoelectronics manufacturers, imager designers, and researchers. The privately owned company with more than 50 employees working in the Swiss headquarters was founded in 2006 by Beat De Coi.